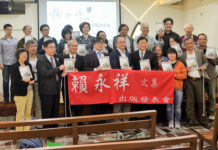 At 8:00 p.m. in the evening on June 22, the next day of summer’s extreme, there was a prayer meeting celebrating Ken-Sim’s 20 years’ incessant publication at the arcade of Tainan bookstore of Taiwan Church Press(TCP). Except a classical oil-lamp in solar battery lightening at the prayer meeting and a shining cross driven by pedal electricity standing above TCP, the electric lights of the whole TCP building were switched off. This is a moment that the staff of TCP and some Tainan citizens pray and act together to take care of our green earth! Since 1996, the incessant publication of TCP’s Keng-Sim weekly has reached an amazing 20 anniversary this year and now it is the most circulated Christian material in Taiwan with 180 thousands copies per week. Keng-Sim weekly is offered free to church, hospital, community, school and individual person, inspiring people with a genuine life story to warm up their hearts and save their souls. Rev. 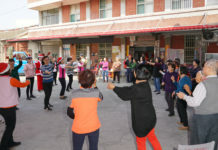 Fang Lan-ting, president of TCP, expressed that the point of this payer meeting did not aim to be like a ritual religious gathering, but to invite more citizens to take care of our green earth together and become a good house keeper for God. 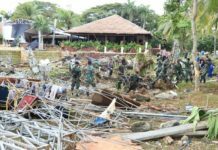 Through switching off the electric light in the evening and feeling the inconveniences of lives without electricity, those desperate needs of the poor and the marginalized might be illuminated to us, said Rev. Fang. Rev. Chang Li-fu, former president of TCP, was also invited to share the genesis story of Keng-Sim weekly. Due to most churches’ weekly report then caring about the internal affairs within church wall only, an inspiring idea occurred as “Why not share our witness and blessings of God’s grace to more people around us, if some kind of evangelical pamphlets could be attached or inserted in these routine weekly church reports”, recollected Rev. Chang. After recruiting two devoted elders to offer for three year’s printing and editing, Keng-Sim weekly officially launched in 1996 and kept serving Taiwan society until now! With the classical oil-lamp lightening, symbolizing “Your word is a lamp to my feet and a light to my path”(Psalm 119:105), Rev. Fang Lan-ting blessed the audience attending the prayer meeting commemorating Keng-Sim’s publication for 20 years.